We Did It! So Can You! 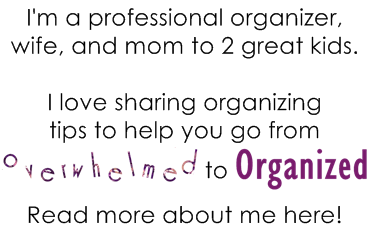 | From Overwhelmed to Organized: We Did It! So Can You! Welcome to the "We Did It! So Can You!" series. This series is about real people decluttering their homes, one day at a time! Busy people, with too much stuff, who decided to take the plunge and purge. Michelle is a mom of 2 and runs a home daycare in her apartment. She's got kids coming and going all day and is constantly dealing with toys, clothing, and kitchen clutter. Her bedroom (like many of ours!) is the place to stash things to deal with later. But then other things take priority so the clutter builds up. She also had what she called an "I'll just stuff it in here for now closet". Michelle has been working her way, one bag at a time, through the clutter in her home. She even got her hubby involved! She commented early on that seeing so much floor space was exciting. I love comments like that! With 2 growing children and a home daycare, Michelle had outgrown clothes, shoes, and boots, as well as lots of "haven't been played with awhile" toys. 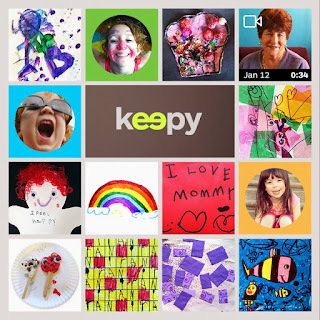 And of course kids' artwork and creative projects. And kids' books. She also determined how many clothes she really needs for each of her children and purged extra hand-me-downs instead of keeping them "just in case". That's a huge way to prevent clutter from building up! What does Michelle do with the items she purges? She has tossed a lot in the garbage and recycling. She has also given others to friends and family, the church nursery, her husband's work's daycare, families in need, and Value Village. She's also sold some items. Everyone loves good before and after pictures for decluttering projects and this is one of my favourites from Michelle. Isn't that difference incredible? 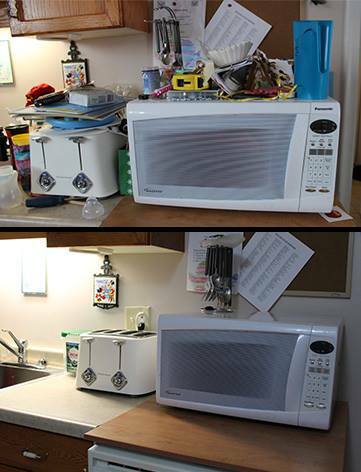 She went from what several people pointed out is a fire hazard with papers and other "stuff" all over her toaster and microwave, to having clear surfaces in that whole area of the kitchen! Most of the clutter was moved back and forth from the toaster/microwave to the table, over and over. 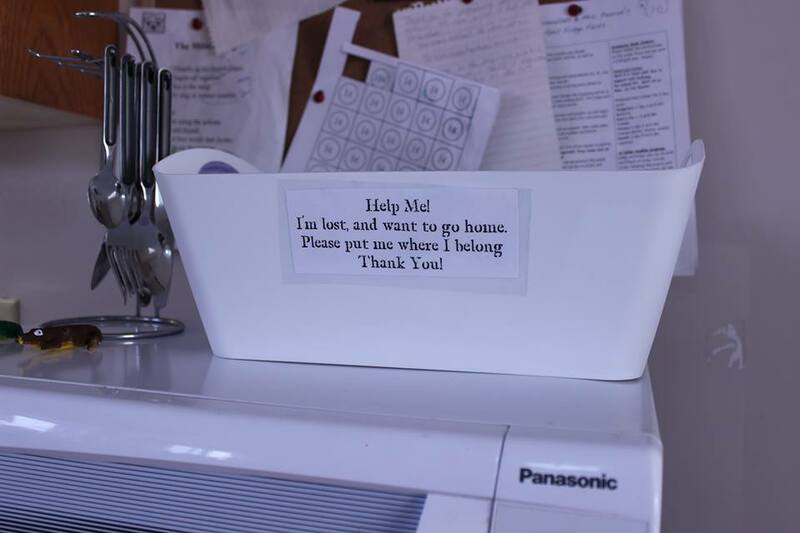 But Michelle found homes for the items and recycled things she didn't need. Much better than moving things all the time! A few months after she originally posted the above pictures, Michelle posted an update. Those surfaces were remaining clear due to her daily maintenance, a strategically placed recycling bin, and a great little basket. Decluttering isn't just about physical clutter. Michelle tackled her electronic clutter too. She decluttered her 3 email inboxes and tackled the files on her hard drive. One of the benefits of decluttering is that Michelle has been able to organize her home better. So life can run smoother. Especially with the things she uses in her daycare. 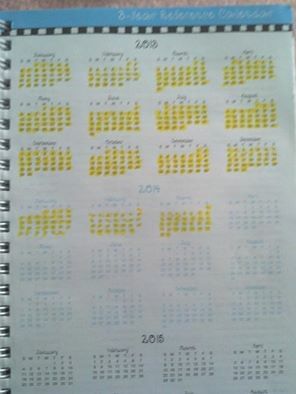 Michelle has been tracking her decluttering progress by highlighting a day on her calendar for each item she purges. Check it out. She's done so well that she completed the entire year in only a few months and she has already moved into next year! And she's still going! Michelle makes use of little bits of time here and there, like while her kids are eating lunch. She does a little at a time and it has really added up over the months. She also takes advantage of times when her hubby can watch their kids, so she can work without distractions. 5 months and I have given to families in need, donated to charity, and even sold a few items. Most (65%) of the items I have decluttered were clothes. Seeing the total of 455 items makes me so excited and proud of my efforts. However I know there is so much more to go through. I feel now that the easy stuff to declutter is done, now I will be going through more bins that hold items I really don't need but struggle to let go of. I'm ready to begin part 2 of my decluttering and organizing. Feeling great today. ... I sat on the end of our bed with my hubby today and took note of the floor space we have gained. I first thought... where did it all go? Our usual places to move clutter around to is remaining clutter free. Still have more bins of stuff to go through but we are beginning to see a difference now and it feels great! Doesn't that make you just want to go and declutter something?! 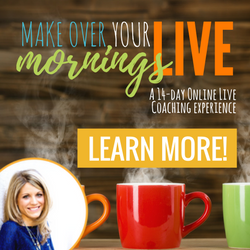 Michelle has been an encouragement to others in the group, cheering them on, sharing her ideas, and answering questions, all while being vulnerable, sharing her progress and asking her own questions. Thanks for all your contributions to this challenge Michelle and congratulations on all your decluttering efforts! 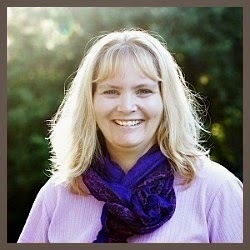 If Michelle can declutter while taking care of her own family and her daycare children, then you can do it too! Labels: 365 in 365, 365 Items in 365 Days Declutter Challenge, decluttering, purging tips, We Did It! So Can You! Clutter is somethings I struggle with, and work on constantly. I've just sent my request to join the FB. Can't wait to get acquainted with you ladies! Welcome to the challenge Kristi! Happy decluttering! I love hearing success stories! Congrats Michelle!! Me too Kathe :) So motivating! Working with someone is always good Andrea! Happy decluttering! Great success story! I think you just motivated me to "declutter." We struggle the most with this in the kitchen. It's the catch all of EVERYTHING! Kitchens are tough to keep decluttered Stacey but it CAN be done! Good luck! Thanks for sharing your story! I need to do this with my home office. There is paperwork and junk everywhere and I just haven't had the gumption to tackle it yet. What a lovely, inspiring story. 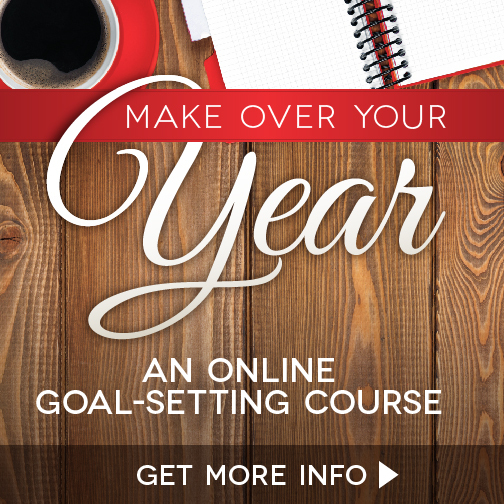 It has encouraged me to join the FB group and I love the idea of the calendar - very visual. I have been decluttering for a long time now, but there is still much work to be done and being part of the group will help me to tackle the more difficult areas of my home that I have been putting off. Thank you!